This week's Tuesdays with Dorie: Baking with Julia was co-hosted by Jessica of My Baking Heart and Margaret of The Urban Hiker. The chosen recipe was rugelach. Rugelach are actually Jewish pastries made with sour cream pastry dough. They are made in the form of a crescent by rolling a triangle of dough around a filling of fruit, nuts, or fruit preserves. The rugelach made in this recipe is slightly different in that it is made with a cream cheese pastry dough, and the rolled dough and filling is cut into slices before baking. I've actually made rugelach a few times prior to this - love the stuff! 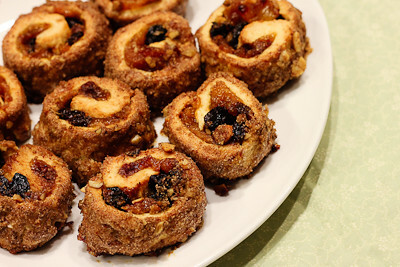 I love this Barefood Contessa recipe and we actually also made rugelach back in 2008 for TWD. I'm not a nut person so I didn't put nuts in my filling, but I did put some nuts in the streusel that the pastries were rolled in. I made apricot lekvar (homemade fruit butter) and filled my rugelach with dried cherries, raisins, and dried apricots. I did not have any problems with this recipe, except that I did not look at it ahead of time and did not realize how much refrigeration time was required, so I did not finish baking them until very late today! I have to say that I love this version of rugelach. 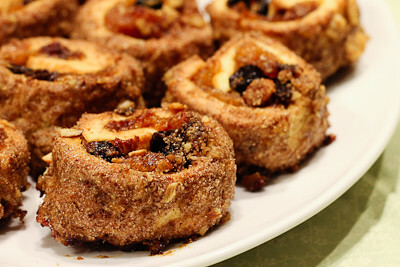 The sugar and cinnamon mixture that the pastries get rolled in caramelizes in the oven and gives it a wonderful, crisp texture. Then you bite into the cream cheese pastry that is so light and flaky, and then you taste the apricot butter and dried fruit bits. I think I just ate about ten of them in one sitting and my husband asked me to hide them from him because he can't stop eating them! This recipe is definitely a keeper, and I can't wait to make it again. Thanks to Jessica and Margaret for hosting; you can find the recipe on their blogs here and here. Make sure you check here, too, to see how everyone else in our baking group enjoyed these pastries! 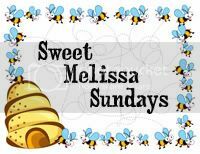 Yes--another late entry like my own! I had the same experience--I kept reading the recipe and realizing, ANOTHER long chilling period?! Ha. It was totally worth it though--weren't these awesome? Glad you loved them too! I'm glad you like the recipe, especially after trying several different ones! I loved this and will make it again. I'm eating up the remainder of my prune lekvar on toast as I visit blogs this morning. Looks beautiful! I liked the pastry, too. Gosh your rugelach are beautiful. My family inhaled these too. Hopefully I can find time to make them again soon. Your cookies came out really nice. That apricot butter was something else, wasn't it? these even look super crispy--excellent! rugelach is amazing and i can tell these were delicious. A keeper for sure. They look wonderful. Oooh, can you tell us what was the free gift that you got from the Fairy Hobmother?